Discovering Igbo Roots Through Genealogy and DNA - who is nicka smith? How genealogy and DNA helped take my maternal line back to Africa. It all seems so simple at the beginning. Spit in a tube and land a windfall of cousins and more importantly, ties back to Africa including the names of relatives, villages, and the ethnic groups our ancestors are from. On the other hand, family historians and genealogists who have been steeped in DNA research know that’s often not the case. DNA research and genealogy go hand in hand – one simply cannot operate without the other – and both only go as far as the amount of time you put into them. 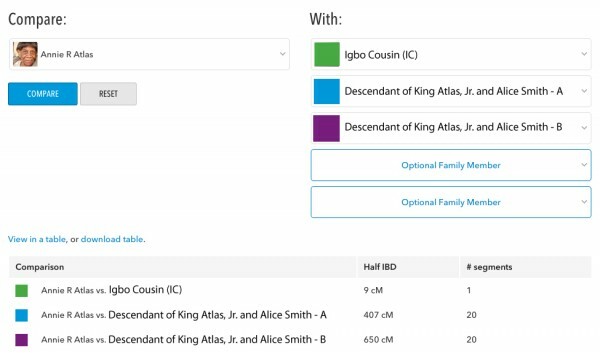 Many of us in the African American genealogy world were excited about having an expanded pool of autosomal DNA matching possibilities with traceable lineage in West Africa. As the first results started populating, I received a message from a person who participated in the project. 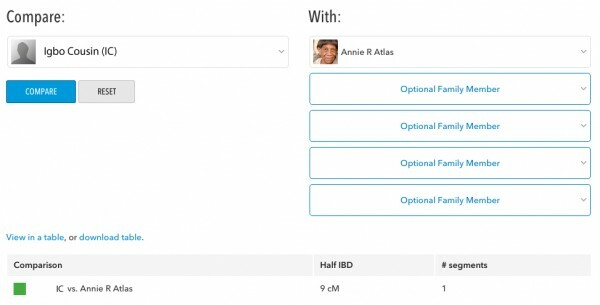 My soon-to-be 99 year old maternal grandmother, Annie R. Atlas, was a 9cM match with a genetic cousin (who I’ll refer to as Igbo Cousin (IC)) with roots on both sides of their family in Nigeria among the Igbo. The tiny, yet significant 9cM of shared DNA between IC and my maternal grandmother Annie on chromosome 11. While some would scoff at a 9cM match, this is HUGE for those who conduct African ancestored genealogy research. It’s enough to spend decades of your life just being able to find the names of your formerly enslaved ancestors, but to be able to genetically match someone who was actually born and raised in an African country AND has lineage on both sides going back beyond the Transatlantic Slave Trade?!? Me, after finding out about our Igbo ancestry. 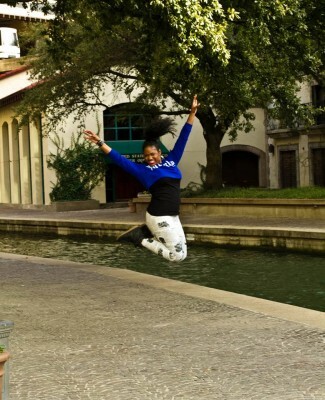 LOL Actually, this was a different day but the jump still counts. Credit: Carolyn Callahan of Precision Photography by CC. To date, we have 15 maternal family members (including me) have taken tests with 23andMe. 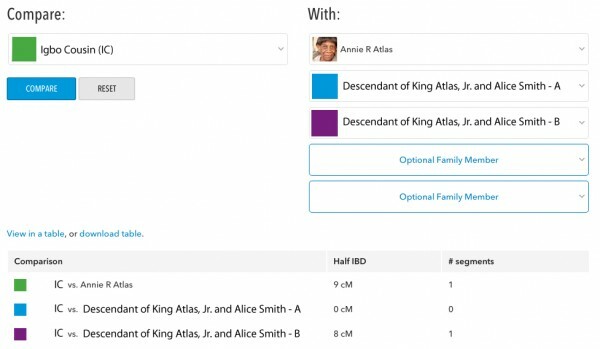 Their relation to each other spans the gamut of our family tree and this is deliberate – we wanted as many people to test as possible so that we could attempt to “reconstruct” as much of the genome of King Atlas, Sr. as we possibly could. As I went person by person, it appeared as though no one but my grandmother shared DNA with IC. Then, I hit what appeared to be a match. A first cousin twice removed of my grandmother appeared to share DNA in the exact spot as IC. This cousin, who I’ll call A, is a descendant of King Atlas, Jr. and Alice Smith Atlas (nee Jacks, Tucker, Franklin), my grandmother’s paternal grandparents. This information has been confirmed through oral history, traditional genealogy, and finally DNA. Based on the International Society of Genetic Genealogy (ISOGG) wiki article, Autosomal DNA Statistics, the amount of DNA that cousin A and my grandmother share was right on the money with what’s average. The apparent overlap between my grandmother and new cousin IC (green bar) and my grandmother and cousin A (blue bar) on chromosome 11. Then, I noticed one other cousin also appeared to match my grandmother, cousin IC, and cousin A in the same spot on chromosome 11. We’ll call this additional cousin B. Cousin B is the great grand niece of my grandmother. Cousin B is also a descendant of King Atlas, Jr. and Alice Smith Atlas (nee Jacks, Tucker, Franklin), my grandmother’s paternal grandparents, and they are a descendant of my grandmother’s parents, Louis B. Atlas, Sr. and Susie Lee Atlas. This information has been confirmed through oral history, traditional genealogy, and finally DNA. The apparent overlap between my grandmother and new cousin IC (green bar), my grandmother and cousin A (blue bar), and my grandmother and cousin B (purple bar). Due to cousin B’s closer relationship with my grandmother, they share nearly 250 cM more than my grandmother and cousin A. Now, this appears to be a definite slam dunk since my grandmother and two other known cousins (A and B) appear to match IC in the same exact spot on chromosome 11. But, lets take this a bit further. Although both cousins A and B match my grandmother in the same spot, we must be mindful that they have DNA from separate sides my grandmother’s family – cousin A from just the paternal side and cousin B from both the paternal and maternal side. In order to be sure which side new cousin IC shares relation, we need to compare cousins A and B to cousin IC to see if they too match on chromosome 11 in the same spot. Bam. No magic blue line, no match with new cousin IC and cousin A, meaning the relation is on my grandmother’s mother’s side of the family. IC matches my grandmother and cousin B in the same spot on chromosome 11. Thus, as noted above, the relation has to be on my grandmother’s maternal side of the family. 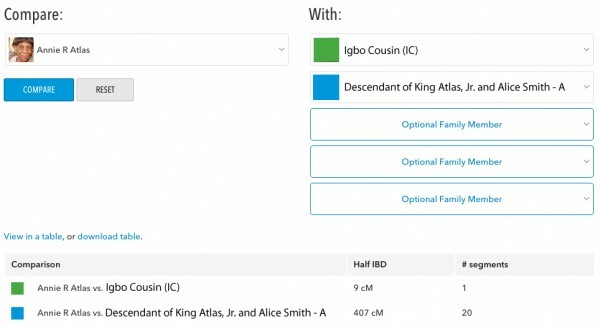 Further communication and testing of more genetic relatives of IC has indicated that our Igbo ancestor was from what is now Umuahia in Abia State in Nigeria and that the match is also on IC’s mother’s side. Since IC’s maternal haplogroup is not the same as ours, the match is most likely on IC’s maternal grandfather’s side of the family. After mapping out the generations, the most recent common ancestor is likely one or more of IC’s 4x or 5x great grandparents on her maternal grandfather’s side and one or more of my grandmother’s 2x or 3x great grandparents on her maternal side. IC will be testing even more relatives to narrow the relation down further to a specific village and even deeper family line. Stay tuned for more! We’re excited! 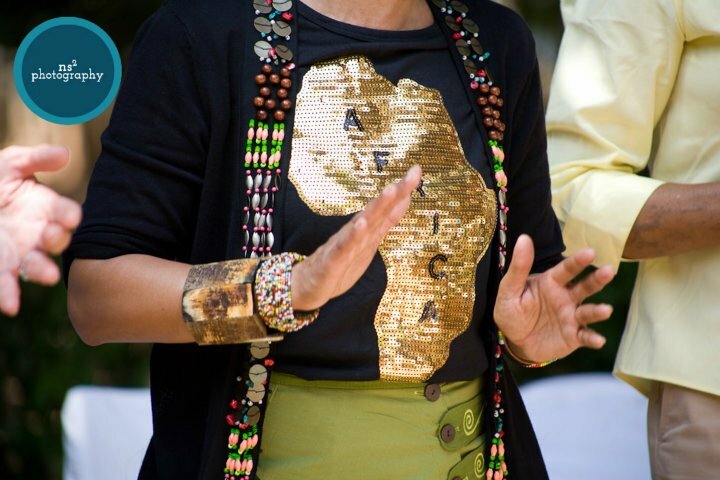 (1) “23andMe’s African Ancestry Project.” The 23andMe Blog. N.p., 1 Nov. 2013. Web. 20 July 2015. <http://blog.23andme.com/23andme-research/23andmes-african-ancestry-project/>. Wow Nicka, I am so excited for you. You can bet I will stay tuned.